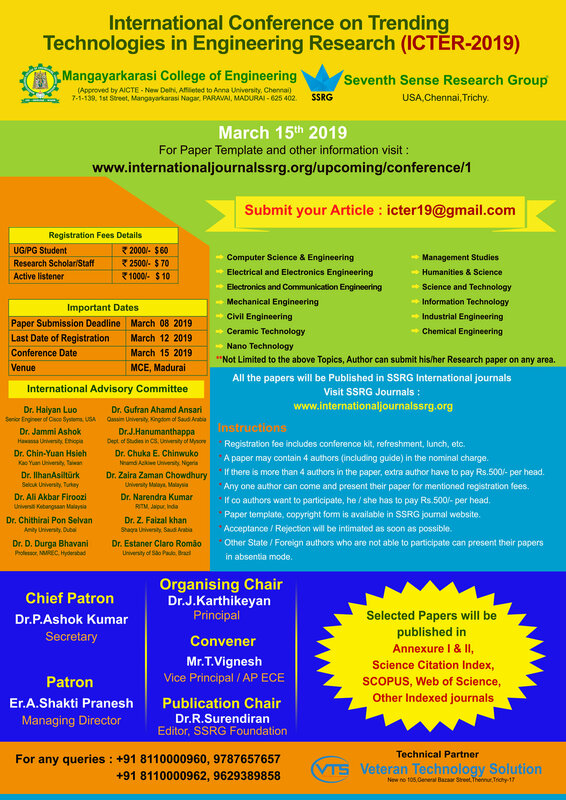 International Conference on Trending Technologies in Engineering Research(ICTER-2019), Mangayarkarasi College of Engineering, Mangayarkarasi Nagar, Madurai, India. The aim of ICTER-2019 is to bring the research domains in mathematics and information technology on a single platform. This conference will bring the research communities of different fields together at one place to share their research and ideas. The main purpose of this conference is to incorporate interdisciplinary research to bring out best applications. Civil, Mechanical, ECE, EEE, CSE, Bio-Tech, Chemistry, Physics, Mathematics, Linguistics, Management, Economics, Political Science, Geography, Agriculture, Humanities, Education, Medical Science & All Engineering Discipline. 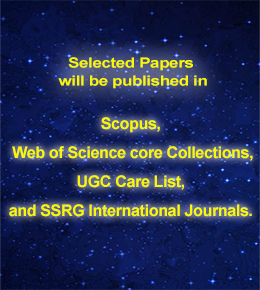 **Not Limited to the above Topics, Author can submit any subject paper. ** A paper may contain 5 authors (including guide) in the nominal charge. ** If there is more than 5 authors in the paper, extra author have to pay Rs.500/- per head. The historic Meenakshi Amman temple is located on the southern bank of the Vaigai River, Madurai, Tamil Nadu. Built sometime between the year 1623 and 1655, the wonderful architecture of the place is renowned globally. Meenakshi Temple is primarily dedicated to Parvati, known as Meenakshi, and her spouse, Shiva. What makes this temple different from the others is the fact that both God and Goddess are worshipped together. Alagar Koil is an exquisite temple situated in the north east of Madurai. The temple is the rest place of Lord Vishnu and is the sacred place for several followers of Lord Vishnu in the region.It is situated in the Alagar hills and is also known as Azhagarkovil. The statue of the lord is made entirely of stone and is a splendid masterpiece created from kallalgar.A variety of statues in different postures of the Lord are all kept in the temple under the same roof and is the best form of distinct temples in southern India. Thirumalai Nayakar Palace was erected in 1636 AD in the city of Madurai, by King Thirumalai Nayak. The palace depicts the perfect blend of Dravidian and Rajput styles. After Independence, this palace was declared as a national monument and till date continues to be one of the spectacular monuments of Southern India. The magnificent palace is located in the vicinity of the very famous Meenakshi Amman Temple. Vaigai Dam, a magnificent man-made structure, is constructed over River Vaigai near Andipatti, Theni District in the South Indian State of Tamil Nadu. Andipatti lies about 70 kilometres from Madurai and travellers on their way to Periyar Wildlife Sanctuary often visit this massive and wondrous dam. Over the years, the site has become a popular picnic spot for group excursions and photo fanatics, especially for its mesmerising scenery. This popular leisure spot is beautifully illuminated in the evenings especially on weekends, and one can spend hours admiring the splendid view. The soft and warm sunrises by the reservoir are a treat to the eyes and should be experienced at least once. Dedicated to Lord Vishnu, the Koodal Azhagar Temple, located in the centre of Madurai city of Tamil Nadu is a unique and famous temple of historical significance constructed in the Dravidian style of architecture and supposedly built by the Pandyas. Koodal is another name for the city of Madurai and Azghar in Tamil translates to 'beautiful one', referring to Vishnu as Koodal Alagar and his consort Lakshmi as Mathuravalli. Beautifully sculpted and carved by adding different shades of colour, the majestic temple imposes itself in the eyes of the beholder. The Gandhi Memorial Museum serves as a remembrance and tribute to the efforts of our very own father of the nation, Mahatma Gandhi. Established in 1959 in his cherished memory, eleven years after his demise, it is one of the few Gandhi Museums in the country. Located in the heart of Madurai, the extensive museum houses a wealth of remarkable mementoes associated with Indian history such as the bloodstained cloth Gandhi was wearing when he was assassinated in 1948. Pazhamudhir Solai is a beautiful temple created in the memory of Lord Subramaniya who is worshipped by several people in southern India. It has great sculptures of Lord Subramaniya carved in wood and marble and is a wonderful temple with giant steps in the front of it.